AT-RT are clone wars era technology that has been refurbished and repurposed by the Rebellion to help them in their fights across the galaxy. They are well armored and can be outfitted with a variety of weapons making them durable and powerful war machines. The AT-RT is the rebellions first support unit and is common in a wide variety of Rebel lists. The AT-RT is a mobile weapons platform, its primary job is to soak up a lot of damage that would other wise be going towards your troops as well as putting out a consistent amount of firepower turn after turn despite taking damage unlike troopers who will put out diminishing amounts of damage as they take damage. The AT-RT is quite durable with 6 health and armor (especially for its points), but its damage is so low its almost non-existent. However the AT-RT comes with a hardpoint upgrade slot and 3 powerful weapons to equip which both change its role on the battlefield as well as bring it more in line with expected efficiency. The AT-RT also has the Climbing Vehicle and the Expert Climbed keywords allowing it to clamber up buildings without risk of damage making it very mobile for a ground vehicle. AT-RT Rotary Blaster: The Rotary Blaster is the most versatile weapon available for the AT-RT, and generally the best option. For 30 points it adds 5 black dice bringing the expected damage output to 3.125 which is still below average, but a significant increase from the original 0.75. Because the AT-RT surges to critical, the Rotary Blaster is also fairly decent at shooting armor dealing an expected 1.25 damage. The Rotary Blaster is the preferred weapon on the AT-RT and recommended. AT-RT Laser Canon: The Laser Canon increases the range from average to range 4, but also introduces a minimum range of 2. This makes the weapon one of the only long range weapons available to Rebels at this time which is quite useful. The Laser Canon also increases the AT-RTs expected damage from 0.75 to 2.125 which is still well below average, however the Laser canon also has Impact 3 meaning that it has the same expected damage against vehicles as it does against troops making this also one of the Rebels first anti-vehicle weapons. The Laser Canon is great in lists that lack range or the ability to punch armor and is situationally recommended. AT-RT Flamethrower: The Flamethrower greatly increases the AT-RTs expected damage at range 1 from 0.75 damage to 6.75 (assuming a 5 man trooper unit). This weapon has blast meaning it ignores cover, as well as spray meaning it adds its dice to the pool for each model in the target unit. The Flamethrower is an incredibly powerful weapon, but relies on you being able to get the vehicle close to the enemy which is not always easy to do. The flamethrower is strong for dense terrain maps and against lists with lots of troop units and is situationally recommended. The AT-RT has a weapons hardpoint and a comms upgrade slot. In general the AT-RT should always be fielded with a weapon on the hardpoint slot to get some damage dealing potential out of the points you have invested into it (although there are some reasons you may not discussed in the tactics section). The AT-RT may or may not be fielded with a coms upgrade, but generally it is best to save the points for other things in your list. The exceptions being that an AT-RT with a flamethrower can also make great use out of a comms jammer, while in range to use the flamethrower the comms jammer also allows you to disrupt enemy plans and keep your target from escaping or retaliating on the following turn. The Long Range Comms and HQ Uplink can also be good choices for the Flamethrower or Rotary Blaster AT-RT who wants to wander farther from your commander. There are several ways to play an AT-RT depending on what upgrades you give it, but all of the uses can be simplified down into keeping wounds off your troops so they can do their job. This can be accomplished many different ways, from being a threat and distraction to literally being in the way. AT-RT equipped with a Rotary Blaster are generally well balanced and adaptable, they can handle troops and vehicles and will end up doing the most damage over the course of an entire game because of the combination of their weapon range and the number of dice they throw with each attack. Generally this variant of the AT-RT wants to move around the battle field to where it is needed most and be a nuisance and target for the enemy. but it is also happy sitting in one place and aiming before shooting if it has a good target. Because this load-out has no strong target preference when deploying this vehicle you can place it either at the beginning to try and bait your enemy into deploying counter to it, or you can deploy it last opposite the bulk of the enemy forces. the Laser Canon variant of the AT-RT is a dedicated vehicle hunter. Generally this variant of the AT-RT wants to deploy across from an enemy vehicle so that it can focus fire on it, and for that reason will want to deploy after it. Because the laser canon only rolls three dice it is very ineffective against troop units that have cover or a dodge token and will want to avoid shooting troops if other targets are available. If your opponent has no vehicles then the laser canon is best used for its long range and placing suppression on enemy units at range they cant retaliate from. Because of its long range and its two black dice, a laser canon AT-RT likes to use its range to be able to aim instead of move and then shoot, increasing its damage output against vehicles from 2.125 to 2.595.
the Flamethrower variant of the AT-RT wants to keep pressing forward as fast as it can into the enemy troops, and once there cause as much damage as it can before being taken out. A smart opponent knows that the flamethrower AT-RT wants to get to troop units as fast as possible and so will deploy away from it if possible, because of this it is important that this unit is one of your last to be deployed. If you are playing the Flamethrower variant it is also a good idea to equip a comms upgrade so that you can have a better chance of controlling when it activates. Being that close to the enemy with such a short range makes getting the first activation that much more important. 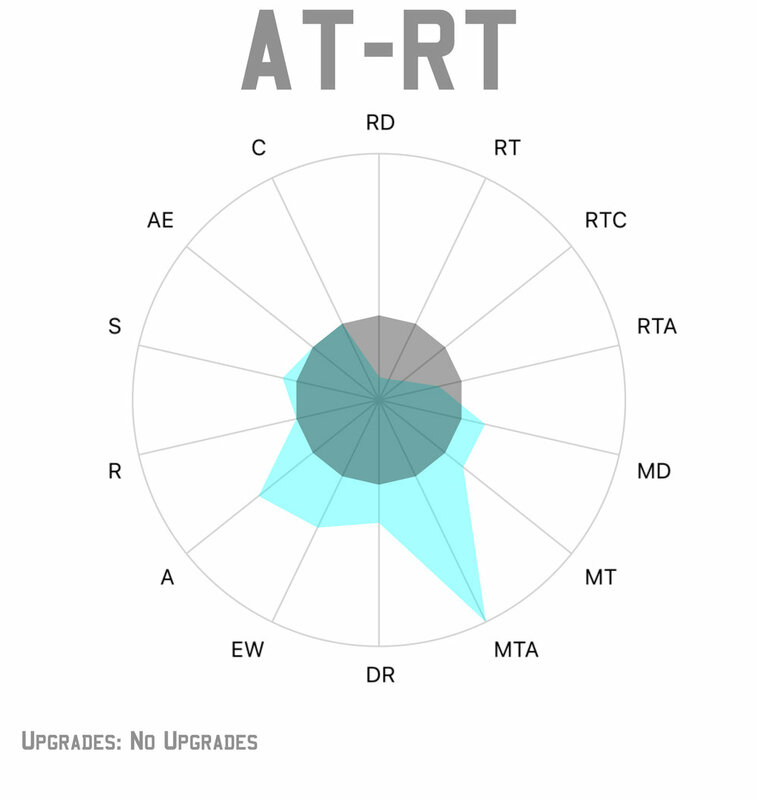 there is also a trend of using the AT-RT with no upgrades. Interestingly without a hardpoint upgrade the AT-RT costs closer to a 40 point unit than an 80 point unit, it also keeps the survivability of an 80 point unit and now its melee damage output is actually above average for a 40 point unit making it incredibly efficient if limited in its role. Often when playing an AT-RT like this its primary function is to create a screen for the friendly troopers behind it (granting them Cover 1 because it is a land vehicle) and then dealing damage in melee once it has done its job obscuring the troopers behind it. While the AT-RT has several rules for climbing, it should be noted that it is mostly for thematic purposes and is generally a good idea to avoid climbing if you can. The exception to this is if you can start the vehicle on a building and wont have to move it to cover an objective, especially with the longer range laser canon variant. It is also important to note that the AT-RT is the most common unit to misplay movement on and can get you in trouble if you aren't positioning it properly. In SW:L models are slid along the movement tool, and ground vehicles can only move over terrain approximately half their height or lower. Because of the AT-RTs comparatively small size it is common to see them butted up agains the corner of large pieces of terrain to gain cover, however often they will then be positioned in such a way that they can't proceed forward. When moving an AT-RT around terrain that is taller than half of its size make sure that the vehicles facing is such that there is enough room for the base to clear the terrain when moving. In the below example assuming both the red and blue terrain were above half the height of the AT-RT the blue object would not impede the vehicles path while the red object would keep the AT-RT from being able to complete the move at all even though the movement tool is unobstructed. This will be harder to adjust to for people coming from X-Wing but it is very important as it can cost you an entire activation and sometimes the game. When playing against AT-RT keep in mind that its primary purpose is to absorb damage that you would otherwise be putting into the opponents troops - so attacking it is playing into what the opponent wants. generally they dont do enough damage to be a main focus, however if you do need to destroy it for scenario purposes or other reasons do so as fast as possible using impact weapons if able. The exception to this is the flamethrower variant. If the opponent has a flamethrower AT-RT it is vary dangerous at range 1 (6.75 damage against a 5 man unit!) and should be a priority to destroy, still doing so in as few shots as possible.